How to destroy you Vibram five finger shoes without losing your toes! This was a close call!!! 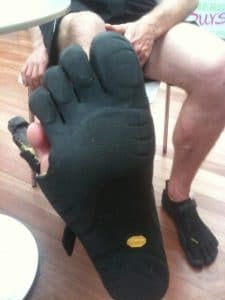 It has been almost 4 months since i have started wearing my Vibram five finger shoes. I’m pretty much in them every working day, everywhere I go. I so was that excited to receive them I even wrote a blog post about them here. Then the unthinkable happened. They got caught in an escalator at my local shopping center! I’m standing on the moving stairs chatting away and the next thing I know the side of the escalator has caught the little toe of the five fingers and instantly tried to drag and chew my foot with it! To make matters worse, it caught at the bottom where the escalator started and I could not get my foot out until the top where the escalator ended. For a second there I honestly thought I was going to lose my toe….. But thankfully I got away with just a little bruising. Moral of the story? Beware of moving escalators when wearing Vibrams five finger shoes! Phew!! 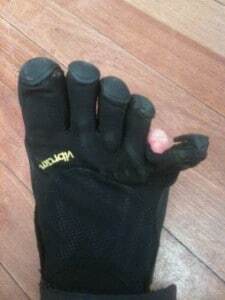 I think what Guy means is..escalators beware,as he has very very long toes, especially when wearing his vibrams. this happened to me on the escalator at Wynyard Sydney. By breath of relief that I didn’t lose a toe!